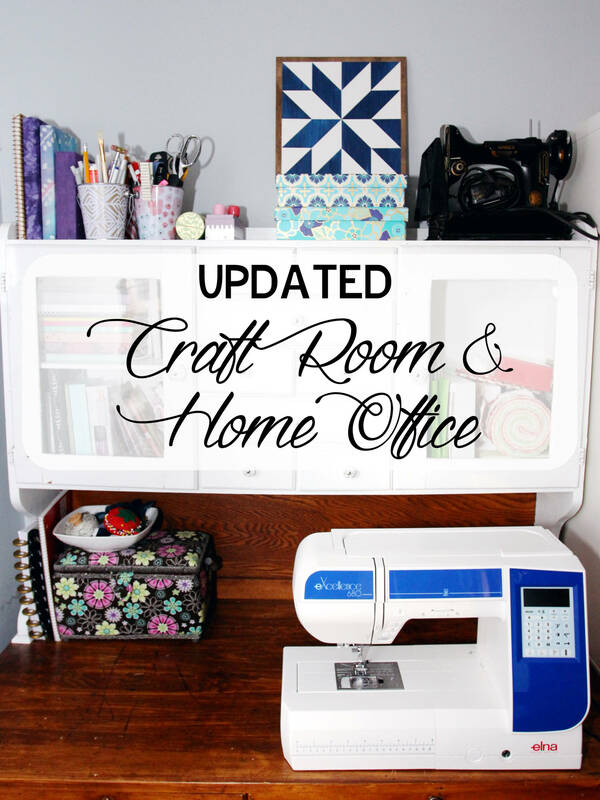 It’s been a while since I shared my craft room. It’s changed a little (a lot) since the last post. 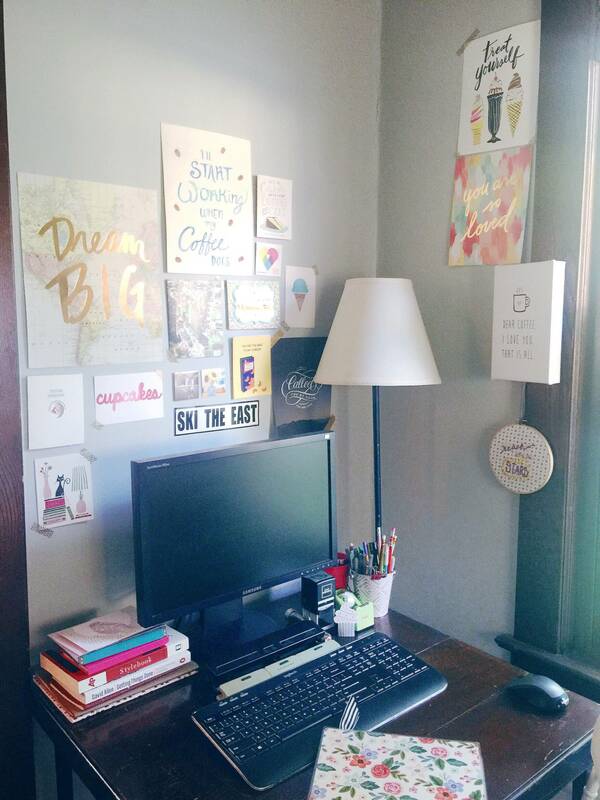 When I started doing more freelance work from home, I knew I needed a change. Working on my couch on my laptop wasn’t quite working. Let me tell you, Netflix is just too tempting. Binge-watching only works when I’m doing mindless activities (like knitting hats for Christmas gifts). All other activities require my real attention. 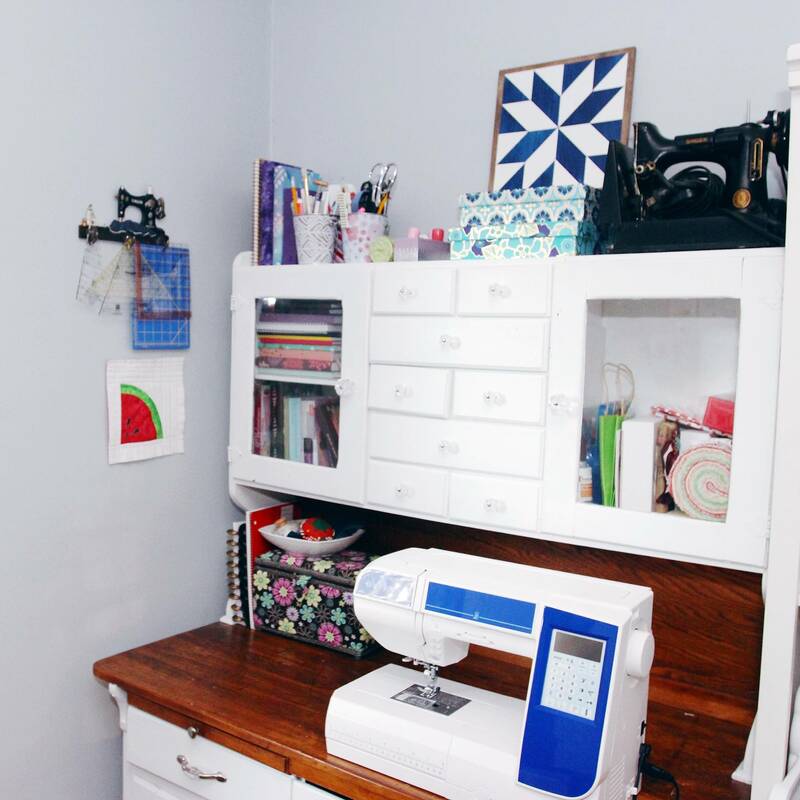 The desk/table is my vintage singer sewing machine table – Since it’s a sewing table and not a desk, it’s very deep with lots of space! 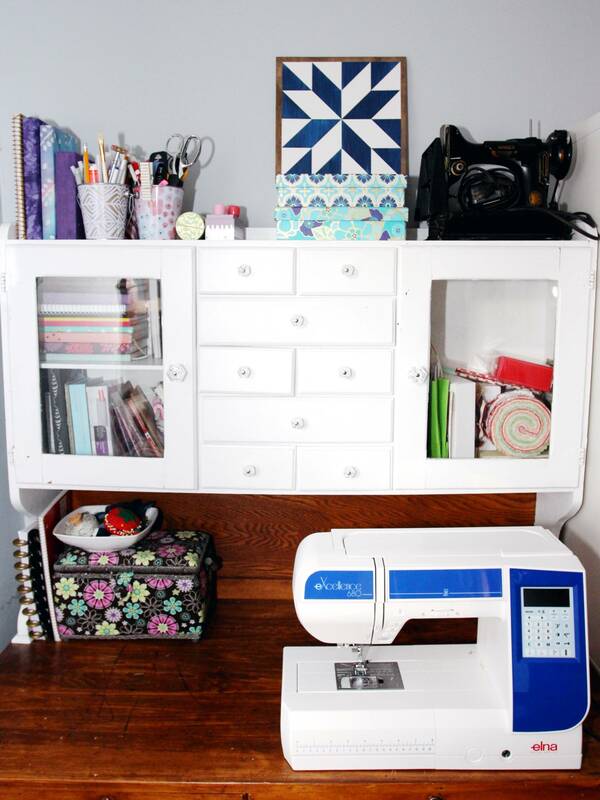 And of course, if I need to sew something small, I can just throw my little machine in there and get to work! The MIL brought the lamp over to our house when we moved, and I just added a lampshade from Made in the Shade. You might be asking what happened to the in-progress wingback chair that was in this corner before… no progress. But it’s been moved to our bedroom. I’m hoping that if I really see it every day, we’ll be motivated to finish it. I think I need a real office chair to complete the space. Currently, I just put a pillow on the little white chair and flip it back and forth between the desk and the sewing table. And next to my desk is probably the best place for my 5 white foam board pieces – my DIY mobile photo shoot station. I added more storage to my sewing area, since the fabric is starting to take over my life. And I put most of scrapbooking supplies up in my attic: I needed more room for fabric, and I haven’t been scrapbooking enough lately for it to be in my actual office. This cleared out a lot of space in the closet. I bought the baskets from walmart for my Expedit cabinet…. And I really liked the grey, but I forgot that they would clash with my rug… oh well, I’ll keep using them for now. I need to work on some mini quilts to make my wall complete! The mini barn quilt from Red Rainboots Handmade is perfect and adorable though! Well, this is as clean as it gets! 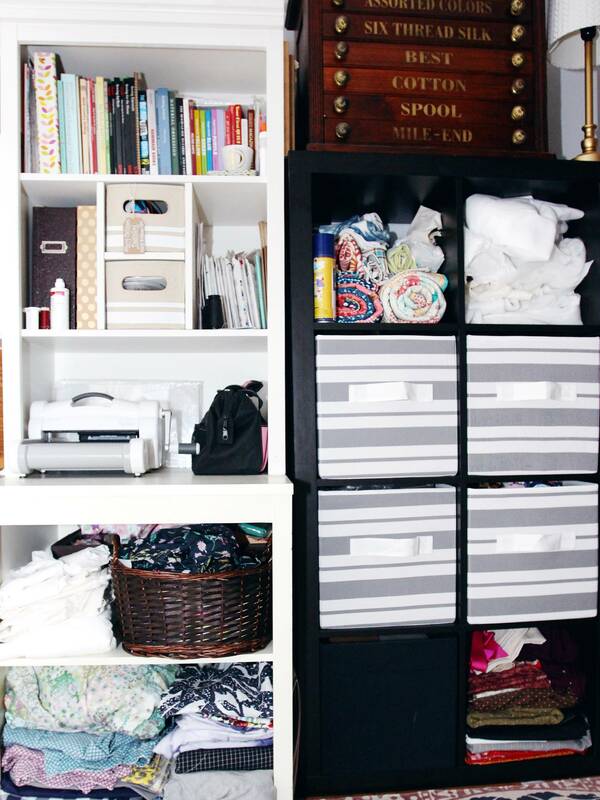 Most of them time there’s fabric everywhere and just a path between the doors 🙂 Remember, pinterest craft rooms are only like that for the photos – and that’s fine. I like pretty photos. 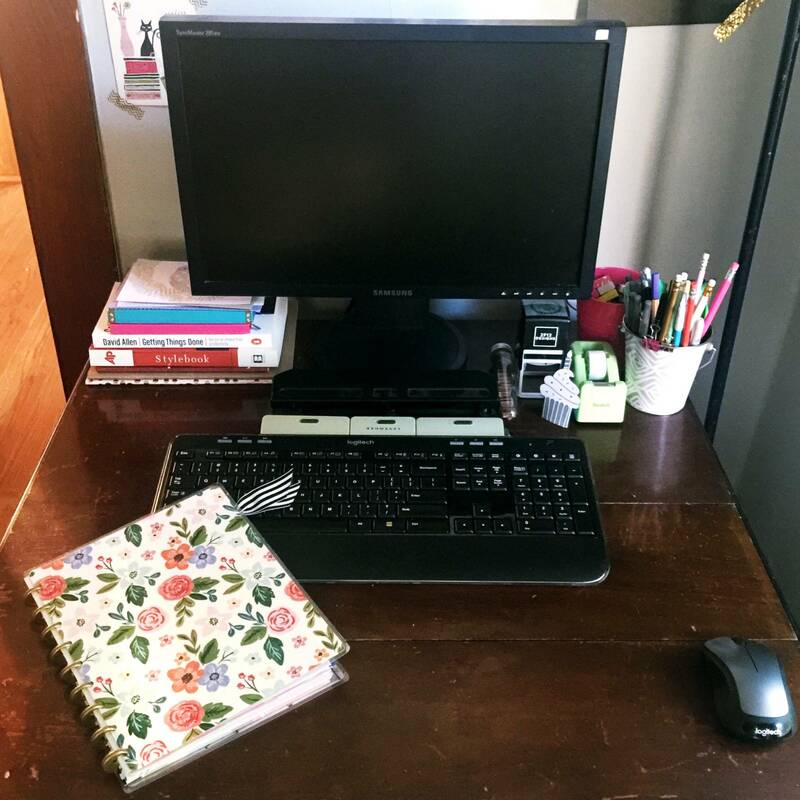 I started using the #MostlySewingSpace hashtag for photos of my workspace, either in my sewing room or out and about wherever I find myself…. PS – today is my last day of Whole 30!! Wooo… Results will be shared next week after I’ve had time to think and reintroduce foods back into my diet. thanks 🙂 I feel much more professional now!